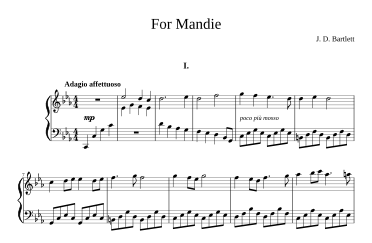 For the music lovers out there, here is the sheet music for my piano composition entitled For Mandie. It’s a good fun piece to play, and you don’t need to be a virtuoso to be able to play it. Preview of top of page 1 of "For Mandie"
This work is copyright and is licensed under a Creative Commons Attribution-Noncommercial-Share Alike 3.0 Unported License by Joshua D. Bartlett. At some point I may provide a recording. I have not uploaded a synthesised version as I despair of ever produced one I’m completely happy with. If you make a recording of the work, please let me know so that I can link to it. Edit: (2012-02-05) I have made some corrections to the original original pdf I uploaded. The original pdf is still available here. Specific changes: mvt 1 bar 8, both Gs in left hand should have been Fs; mvt 1 bar 59, the second E in the left hand should have been a D; mvt 3 bar 23, replaced “con rubato” with “rubato”; mvt 4 bar 8, both Gs in left hand should have been Fs. I began work on this composition in 2005, starting from a chord progression given to me by my friend Mandie. Since that time I’ve played with a few parts of it, making adjustments here and there. One of my aims in composing this piece was to have a good-sounding piano composition that even someone like me—I don’t play the piano anywhere near as often as I would like—would be able to play. I think I’ve achieved that aim. In order to produce nice-looking sheet music, I used a number of technologies. First, I entered the composition into MuseScore. I used MuseScore to do as much of the layout as I could, but there were a few things it would not do quite the way I wanted. So for the pages that I wasn’t happy with, I exported to pdf, used pdf2svg to convert it into a form that I could open in Inkscape, and made the final adjustments using that. I used Scribus to create a pdf with page numbers, title, composer, copyright text and movement numbers, then wrote a little script which used pyPdf to put all the pieces together into the final document. All of the software that I used is free software. This entry was posted in midlength and tagged beauty, composition, download, free, layout, music, piano. Bookmark the permalink.